I do not discriminate against any food group; I enjoy carbs just as much as I like protein. With that said, I usually stay away from meat (fish included, I don’t get why people don’t consider fish to be an animal). I don’t eat meat because I simply don’t enjoy the texture. The concept of eating an animal also freaks me out a little. However, I probably won’t ever declare myself a vegetarian- commitment isn’t my thing either. Plus, my mom makes really good chicken soup (I scoop around the meat) so I don’t wanna miss out on that when I go home for winter break. So where do I get my protein from? I whip up a nice bean salad- kidney beans, black eyed peas, celery, raw onion & pepper, vinegar and sometimes chickpeas & carrots. It’s hearty & cheap, the ideal meal for college kids. I also get my protein intake from peanut butter …. and guacamole. If I’m out and about for a meal, I’ll add falafel to anything allowed. Last week I treated myself to this crazy good vegetarian restaurant in Cambridge, Veggie Galaxy. I’ve been craving this place since the moment I left it last. So I finally went & brought my pals to enjoy it. I was accompanied to dinner with Michaela (also not a big fan of meat, loves lobster though) and our friend Melinda, a vegetarian who’s an agricultural enthusiast & a environmental science major at Suffolk. Our meals: Mich & I got veggie burgers. There are two different patties you can get, chipotle black bean burger or mushroom chickpea. We both got black bean. Then, you pick between four unique combos (or can build your own burger). We both went with the “Kendal Square” burger- ROASTED RED PEPPER PUREE, BEER BATTERED ONION RINGS, ROASTED GARLIC MAYO, BABY ARUGULA (V/GF0) 10.95; YUM. I picked Green Cabbage Slaw as my side & she got fries. Melinda went with their “Club Sandwich” which was an amazing choice on her part…GRILLED TEMPEH BACON, SMOKED TOFU, FRESH TOMATO, ROMAINE, RAW RED ONION, BASIL PESTO & ROASTED GARLIC MAYO (lots of caps bc the place is that freakin’ good). It came with potato salad and fresh homemade chips, all mouth-watering good. Yes we swapped bites, multiple bites. Veggie Galaxy was so satisfying that we decided, at our first visit, that we would have to go again ASAP to explore more of the lengthy menu again. 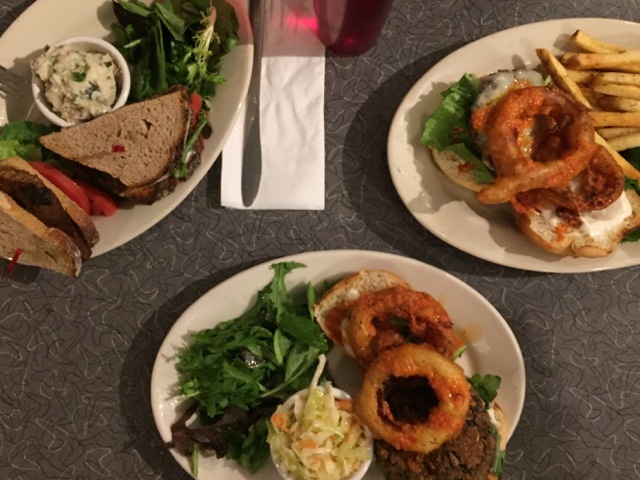 We went last Monday, this time Melinda brought her roommate Liz to the grub-fest. I went with a classic; soup and salad. The soup was tomato basil, tasted garden fresh. 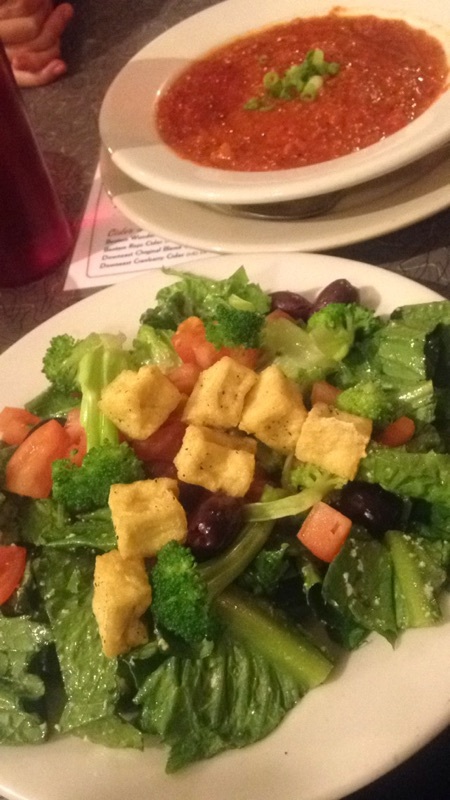 My salad had tofu croutons on it, it was a great addition to the salad & an option I didn’t even know existed! Melinda went with the Meatless Monday- tofu meatball sub. There was a wide variety of breads she could choose from for the sub, included gluten free and vegan. Michaela got the Blue Plate Special. *Backgrounder* ~ Every week Veggie Galaxy has a new special and they serve it on a huge blue dinner dish. It’s a fun way to keep the crowd coming. My favorite meal out of everyone’s was Liz’s. She went with the traditional french toast. It came with warm caramelized banana butter & fresh fruit. 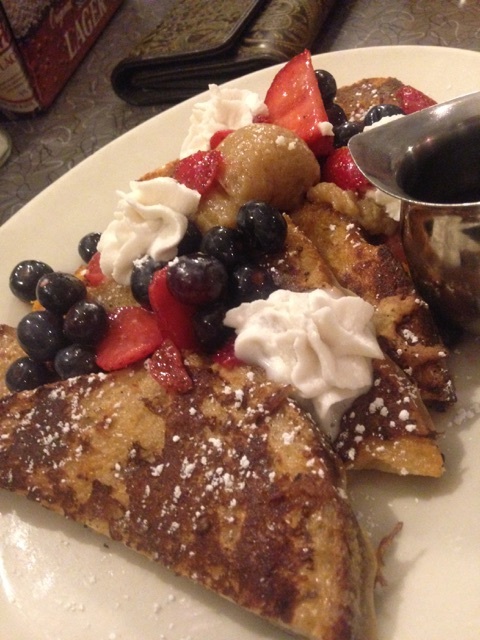 On my next visit I will probably get that, or the stuffed french toast (it’s jammed with vanilla nut vegan cream cheese)! 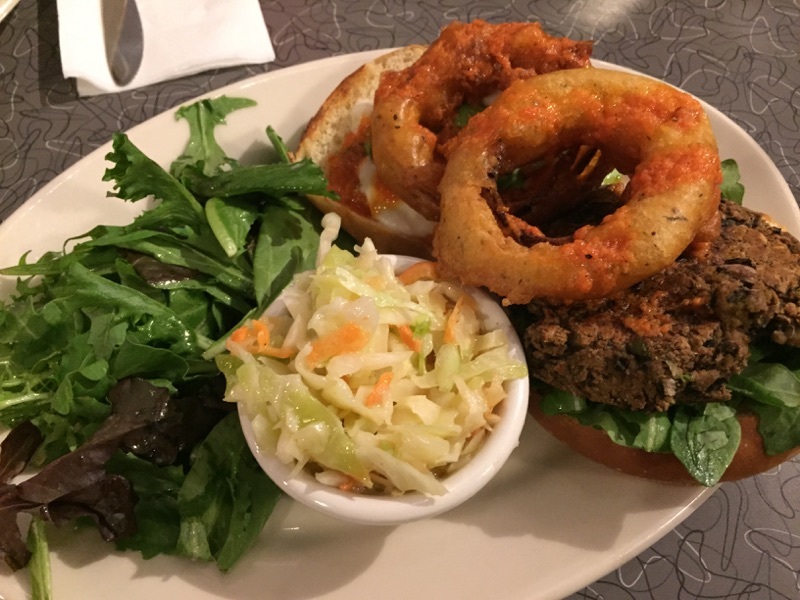 Head over to Veggie Galaxy for endless vegan options, great prices, unique dishes & a fun atmosphere!! It’s a spunky modern place that’s always flooded with hipsters and good vibes. Also I took the liberty of looking of their Blue Plate Special, hurry in! Coconut Whipped Cream?! And the french toast! I have given up refined white flour and sugar so I very much enjoyed living vicariously through your post. Thanks! I’m not usually a veggie person but I need all of this! !